Damage enemy locations or structures by launching a cannonball or become a special delivery by launching yourself! Explore new points of interest that emerged with the Volcano, such as Sunny Steps and Lazy Lagoon. 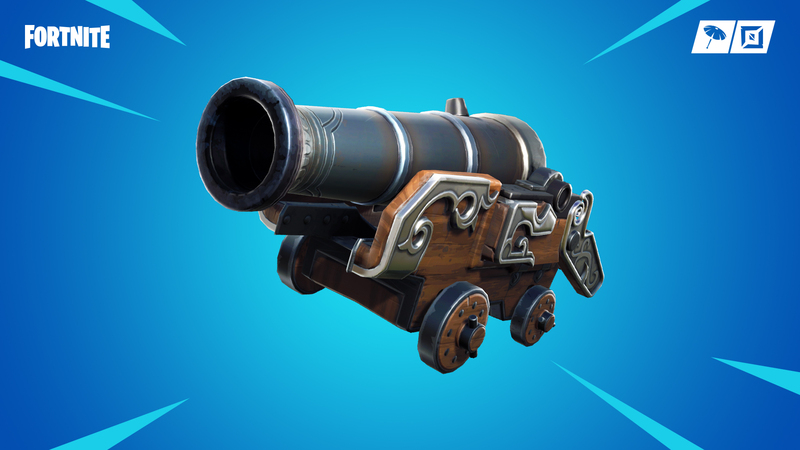 Push the Cannon into position, take aim, and fire! Alternatively, climb into the barrel and launch yourself! The cannon will fire cannonballs or players a great distance. Cannonballs and players can plow through a number of objects before stopping with a bang, causing damage and knockback to nearby players. Deals 100 Damage to enemies on a direct hit and 50 Damage to enemies within a small radius. Supply Drops now properly appear on the map. If the fire button is pressed while the shotgun cooldown is still active after swapping weapons then the shotgun will automatically fire once the cooldown is over. Fixed Clingers causing damage through walls / floors when stuck to a player. Fixed players accidentally sticking Remote Explosives onto themselves after applying a Consumable Bush. Fixed Legendary/Epic Pump Shotgun pellet tracers and muzzle flash sometimes not replicating to other clients. Fixed an issue where players couldn’t use Auto-Run while using a Hoverboard with a gamepad. Fixed items occasionally being invisible to some players. Lava will deal 1 damage per touch and will cause players to bounce off the surface. Watch out! Volcanic Vents will boost players and vehicles into the sky in a gust of hot air! Prior to a match, enable Party Assist on a Daily or Weekly challenge to complete it with the assistance of everyone in your party. Party members are able to provide progress to the selected challenge in addition to yourself. This functionality excludes “fill” players who are added into the party during matchmaking or teammates from large team modes such as Team Rumble. Increased Infinite Dab duration from 11 hours to 12 hours in the lobby. Cozy Campfire now glows while active when viewed through a Thermal Scope. Starting in Season 8, daily quests will be automatically claimed once they’ve been completed. Any Challenges that were ready to be collected will be auto completed and all rewards will be delivered. However, at this time there will be no in-game notification for you receiving these rewards. Fixed a bug where the Lynx Outfit would jitter very badly when playing the original Wave emote in the lobby. Fixed an issue where players were able to aim down sights while jumping. Fixed an issue where weapons picked up would sometimes be incorrectly unloaded. This would happen if a player looted a weapon dropped by a player immediately after being eliminated. Fixed Bush consumable not being destroyed if player takes damage from a great distance. Fixed aim assist to work through windows. Fixed an issue where players could stop themselves from getting on a Zipline by standing too far behind it and colliding into the ground as they try to enter. Fixed an issue where the player couldn’t pick up items dropped around the Zipline pole. Fixed an issue where entering a vehicle while ziplining left the fall damage immunity visual effect on the player. Fixed auto-pickup of items not working when first landing from skydiving. Weapon auto-reloading no longer cancels emotes. Fixed an equipped Trap being swapped after dropping a stack of items or after using the last item of a stack of consumables or explosives. Fixed equipped traps being dropped when using hold to swap to pick up items. Two teams of fifty players fight to the finish! The map has a dotted line, which indicates the “battle lines” between the two teams. Crossing the line will make running into enemies more likely. Farming materials increased 25% over default. Chests & Ammo Crates spawn more often than usual, and carry extra ammo. Players start with a Jetpack in their inventory. More distinct sound for above footsteps. Tuned the distance at which above/below footsteps travel to be more realistic. Improved footstep audio timings when the game simulation is under heavy load. Set Down-But-Not-Out alert sound spatialization from the location of the downed player. Added stereo sounds for all weapons for those carrying the weapon. Added foley audio feedback when crouching and ADS’ing with a weapon. Improved Rocket Launcher incoming audio. 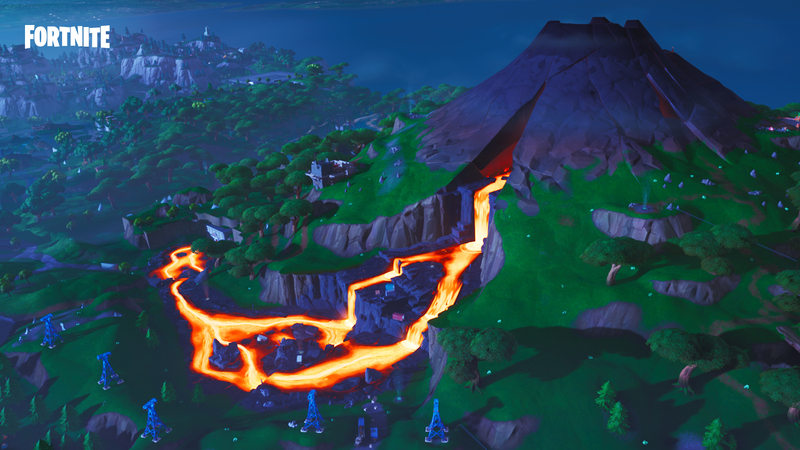 It now plays an additional warning layer if the rocket is coming towards you. Added distant perspective to the enemy glider audio tell. Added a new shield break sound. Improved the “weak-point” hit sound when harvesting. Fixed in-air wind audio restarting when eliminating an enemy while they’re in mid-air. Fixed sniper projectiles not playing impact audio. Fixed “Hootenany” emote getting stuck on infinitely. Fixed Suppressed SMG sound effect occasionally looping continuously incorrectly. Added the ability to access the Patch Notes website from the News Screen. Visual improvements made to squadmate names and indicators. World Markers are now visible in the world when placed close to you. Double-clicking the World Marker hotkey will place a “danger” version of that marker. World Markers placed while aiming with a weapon will also place the danger version. Added 2D UI indicators to the World Markers, making them easier to see through objects. World Markers now have an off-screen indicator and display the distance your character is from them. Placing a World Marker on an item will display that item’s icon and rarity. Placing World Markers remains on the same key for PC and console (KBM: Middle Mouse Button, Controller: D-Pad Left). This button can be remapped to any button you want. Let us know on our social channels what works best for you! Mobile also has a button that can be added to the HUD. Place this button by using the HUD Layout Tool. Added filter tabs to the locker for animated loading screens and pets. Added a card corner icon for certain types of animated cosmetics. Fix cases where the Bad Network Indicator would appear at the beginning of the match due to slow loading conditions. The Battle Pass / Battle Bundle purchase screen now shows your supported creator if one is set. Fixed an issue where the team elimination count was sometimes inaccurate. Fixed an issue where eliminations weren’t properly counting when playing in Playgrounds. Fixed an issue where scrubbing through a replay could cause the player’s hero model to disappear in the lobby. Fixed issue with cosmetic styles not displaying properly during replay playback. Fixed elimination damage numbers being inaccurate in replays. Fixed weapon firing animations sometimes playing twice in replays. Added more visual feedback when buttons are pressed. Changed gliding/freefalling HUD visibility to be more consistent between mobile/other platforms. Player are now able to toggle between crouch and standing states while in build and edit modes. Fixed bug which caused the lobby background to disappear when closing the Report Player dialog. Fixed an issue where trying to switch to build mode and tapping the quickbar at the same time would switch back to combat mode. Fixed an issue where attempting to place a trap using a mobile controller made the player animate as if they were trying to open a door several times before the trap is placed. Fixed players ability to un-crouch while gliding. Fixed action button remaining on the UI during the Battle Bus phase. The ‘Resources’ HUD setting now properly shows in-game after making changes on mobile devices. Fixed an issue where using touch to edit a structure breaks the ability to continue crosshair editing until the button is pressed again. Fixed an issue where dragging an item off the hotbar triggered a double click. Fixed an issue where pick up and zip line activation icon’s default position overlapped with the aiming icon. Fixed controller art sometimes missing in the Controller Setting screen. 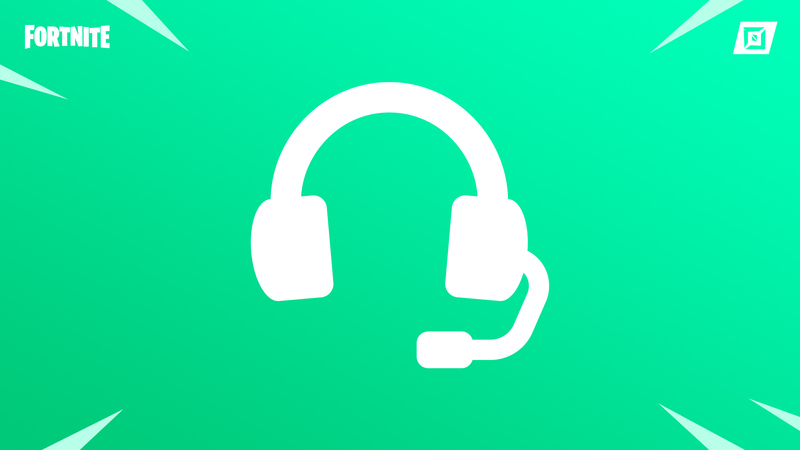 New voice chat options have been added to Creative Island Game menu! Share a single channel while in Creative, regardless of team, then choose who you chat with when playing. 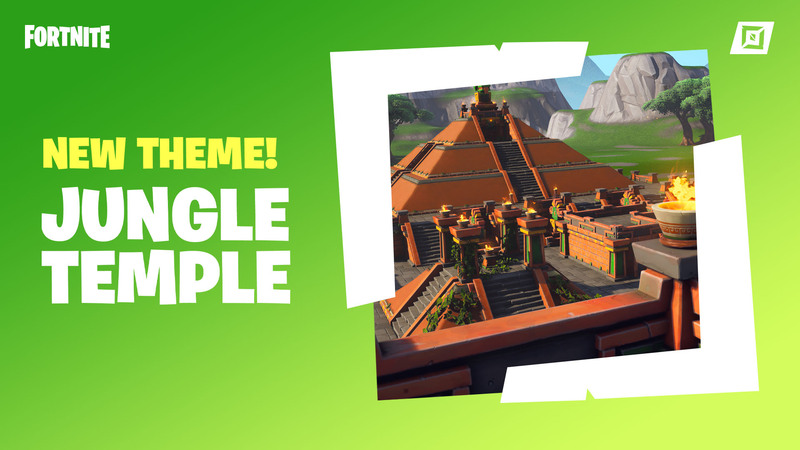 Set up deadly traps or harrowing trials in your own adventure games using the new Jungle Temple Prefab. Renovations have been made to Playground, moving it over to Creative and allowing even more friends to join in on the fun! You can now customize your island’s time of day! A new “Time of Day” option has been added to the My Island menu. By default, time of day will advance normally, which is shared between all islands on the server that are also set to “Default”. You can select a specific hour of the day, which will force your island to always be at that time. Selecting “Random” will automatically choose a random time of day when your island is loaded, and will stay at that time. Islands now load much more quickly. Fixed an issue where corn, various bushes, and chain link fences would prevent players from taking damage from bullets. Fixed an issue where Island portals would always result in players spawning in a skydive animation, forcing a player’s camera to look down even when teleporting onto land. Matchmake with 15 others (total of 16 players) into the new Playgrounds Hub to explore 4 Featured Islands. Or drop into one of five locations on the Battle Royale map to practice. Players will now be reset and Island health settings will apply upon joining an Island. Fixed a bug where be eliminated and entering a vehicle at the same time would cause the player to lose most controls. Your friends’ Playgrounds sessions will appear when browsing Creative servers. The Phone’s Resize mode now allows you to stretch and squash props along a specific direction, either Width, Height or Depth. This works the same as changing Rotation Axis while in Rotate mode. When Resizing props, you can now “flip” props backwards by continuing to Shrink them beyond their minimum size. This also works when a specific resize direction has been selected, and enables new possible arrangements of props! When the Phone is in Resize mode, you can now reset the size of the object to its default size. This works the same as resetting Rotation while in Rotate mode. You can now embed props inside the island terrain. Set your Collision mode to “Nothing” to allow props to be moved right through the terrain. The existing Collision “On” mode has been renamed to “Everything”, and “Off” was renamed to “Terrain Only”. The “Snap Center” position of props is now displayed while Snap is turned on. While rotating props, guides now appear to show you the selected axis of rotation. While resizing props, guides now appear to show the selected direction the prop will grow, shrink, stretch or squash. These visual guides will also briefly appear when switching between Rotate, Resize or Snap modes. Players can now interact with objects like doors, devices and traps even while flying. Fixed the holographic preview of certain (flipped) props appearing in the wrong location when Copy or Cut was used. Fixed some types of props (like Music Blocks) not landing on the ground as expected when Drops mode was enabled. Fixed props falling below the terrain when Drops mode was enabled in some cases. Fixed props moving unexpectedly when copying them with the phone if they were already resized before grabbing them. Fixed many objects being able to be placed faster than the turbo build speed by spamming button presses. Fixed up the word “Rapidly” for the Turbo build delete text. The phone now tries to use the visible prop to determine bounds whenever possible. Ignoring things like the barrier device, elimination zone, etc. Returning the rotate code to use its old pivot logic. The Phone now respects the Size and mirror state of every prop that is spawned from prefabs or catalogs. The move tool now takes the absolute value of the scale before setting the scale values. When placing props beneath the level, drops will not activate and cause them to fall even further beneath the floor. Preventing drops code from setting the new lower transform of the actors if those actor. Write and publish text to the Billboard that can easily be placed on Creative Islands. Base Visible In Game – Added ability to toggle the visibility of base plates. Turn off to hide the device base during a game. Block Weapons In Game – Turn off to allow weapons and projectiles to pass through the barrier. Speed Boost traps can be placed on vertical walls. Added option to hide the checkpoint device during games. Added option to clear the player’s inventory when they reach a checkpoint device. Barrier device can now be set to be all black. 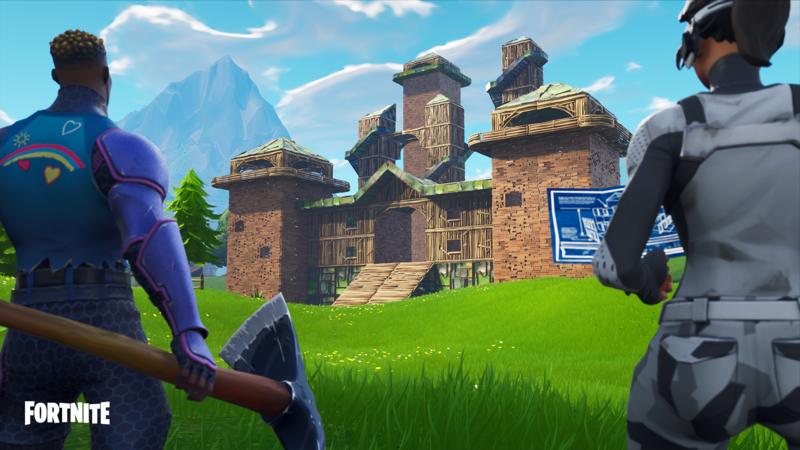 Elimination Zone renamed to Damage Zone. Added multiple options to Damage Zone. Base Visible In Game – Turn off to hide the device base during a game. Damage Type – Allows for immediate elimination or damage over time. Damage – How much damage is applied each damage over time tick. Damage Tickrate – How often damage over time is applied. Safe Team – Designate a team that won’t be affected by the Damage Volume. Shield Damage – Turn off to skip damaging player shields and directly attack their health total. Players can now customize the team a Sentry is assigned to. Added option to turn on/off the bonus ammo for weapons that are spawned from the item spawner. When off, some weapons will have very small amounts of ammo when picked up. Added an option for the Movement Modulator effect to last for infinite time during a match. Fixed issue where starting inventory device would grant duplicate items if the “Drop items when eliminated” game option is set to Off. Fixed challenge gallery items colliding with Hoverboard. Sentries will target players more reliably when they are crouching now. Fixed a bug where pressing Apply on the Team Select dialog could cause players to change to team 1 when that was not intended. Fix a bug where swapping teams could result in going into the Down-But-Not-Out state instead of respawning. Fixed a bug where setting a Player Start to Team None would behave instead like Team All. Fixed an issue where the Game Description screen was displaying on screen even while still restoring from a previous game.